Awaken Your Best Self & Live a Life You Love! Just like any happy, supportive, loving family Celebrations are important. If you commit to sharing your celebrations, aha moments, breakthroughs, achievements and wins along with encouraging and cheering on all the others in our community then this is the place for you! A family that celebrate together. #2. Once you're in; you're in, for Life! If you choose to come onboard, if you’re ready to make beautiful changes in your own life we excitedly welcome you in for life. Sharing your journey with love, enthusiasm and support. Celebrating you will be a beautiful journey and through that; we will create beautiful changes in the world we live in. #3. The greatest investment you can ever make is in you! Everything begins with you. As you grow and enhance your life your presence and beautiful new energy will naturally lift and inspire others. That is a beautiful gift; to yourself, our community and to the world. #4. Nobody puts 'Baby' in the corner! 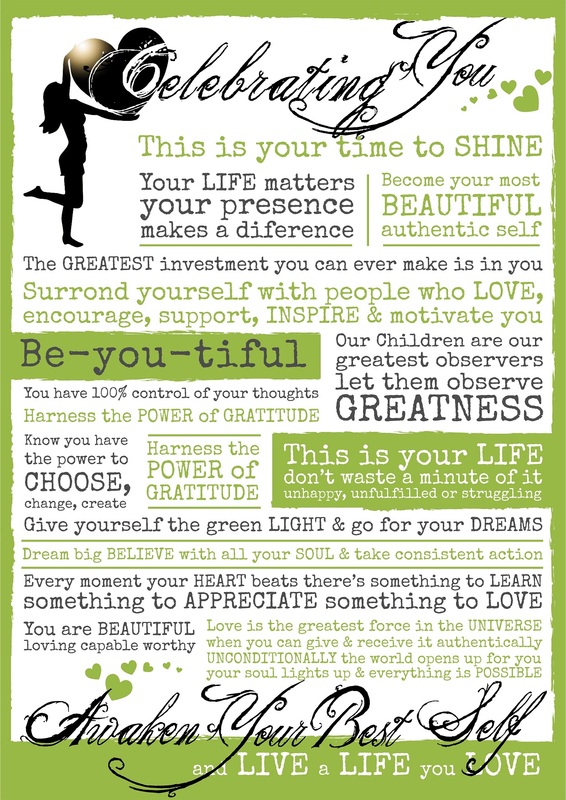 This is your place to shine, to be you and to Celebrate all that you are, all that you do, can do and can be. We are all equal; all beautiful, worthy and capable beyond our wildest dreams. Together we will work to ensure everyone feels it and knows it in the depths of their soul. #5. We dream BIG but we are grounded! We push ourselves to reach our greatest potential, our biggest dreams; be it in our personal development, careers, aspirations or just living a happier, more fulfilling life. But we know it takes works, effort, determination and action every single day, even if only a little step forward on some days. But most importantly a self-belief that we can! and the knowledge that there is a community here supporting and cheering you on every step of the way. #6. Money matters but it's not our top priority! Money is a necessity and a powerful resource to make our lives and the lives of others easier and more comfortable. But if we are focused solely on money we will struggle to obtain it. If we are not happy or comfortable within ourselves the money doesn't matter, it will not change anything. Our focus is on loving, embracing, forgiving and accepting ourselves and others and making a difference, if money comes after that we are in a much better place to do so much good with it. #7. We have the power of choice! You have the power to choose. To choose to be a part of our community, to choose change, to choose you, to choose to make a positive impact in our community, the lives of those you love and the world. We choose to embrace, support, do, create, accept, forgive and love - all. #8. We each have gifts that can change our lives and the world. We are all magnificent but we are unique. We each have special talents and gifts waiting to be shared. This is our special contribution to each other. If you are unclear on yours, we will help you discover it and bring it to life. Combined we can make a massive difference. #9. We share our wisdom and experiences! Everyone has a story to tell. A story that may be filled with heartache and pain but also lessons, love and triumph. We feel safe to open up, share and learn from each other. Respectful and supportive of everyone's story, everyone's journey. So that together we grow and inspire millions. #10. We express gratitude regularly! Gratitude is a simple but powerful force that can transform your life. We acknowledge and share it regularly. It lifts our spirits and allows us to see how truly blessed we are. Whether it’s as simple as a beautiful summer breeze, a magnificent new flower to the health, happiness and lives of our loved ones and our glorious community. #11. We don't compare or put others down! We raise our standards and measure our success by looking within, by improving on our past achievements and learning from our experiences. We don't make excuses, nor do we believe others have succeeded because they had it easier or access to more. We are all unique with so much to offer. As we grow and inspire we do what we can, from where we are, with what we have right now, with gratitude and love. #12. We become the greatest example! As Gandhi said "be the change you wish to see" we lead by example. We practice what we preach and do what we say. Starting in our own homes. We know our children are our greatest observers, let them observe greatness. #13. We promote self-love and self-care! We know that if you’re not happy with your own company, with what you have, with what you can enjoy now and don't take the time to get to know you, to revitalise, relax, just be and take care of you - you won't find happiness in the company others, the things you do or the things you have. You will always be searching for that magical thing to make you happy. #14. Your life matters, your presence makes a difference! If you embrace, resonate and love all the rules we can't wait to get to know you and share in your magnificent journey of a lifetime. No matter who you are or where you've come from your life matters and your presence makes a difference. If you choose not to come on-board we wish you every success, joy and an abundance of love in whatever you choose to pursue. #15. Love is the greatest force in the universe! When you can freely give and receive it authentically, unconditionally the world opens up for you, your soul lights up and everything is possible. You have everything you need within you to create a remarkable life, to become your most beautiful authentic self and make an amazing difference in the world. This is our mission and declaration to you. YOU ARE THE REASON, YOU MAKE THIS POSSIBLE! Karen and the PD4Women Family!